For our first trip together, Ben and I chose to go to Romania. It had nothing to do with the fact that much of my family comes from Romania, and everything to do with one romantic image on the Lonely Planet’s website of an older, Romanian man playing a wind instrument on a lush green hill. Well, that’s what it seemed like when, two minutes later, we purchased our airplane tickets — without cancellation insurance. I never felt that feeling of absolute serenity wash over me. I never felt like it was all just an adventure, and nothing mattered. Our recent two weeks in Chile were hectic in many ways, but still far smoother than our week in Romania. And the country was beautiful: Valparaiso, a hilly city full of public art, absolutely stole my heart. In Santiago, families welcomed us into their homes, which featured floor-to-ceiling windows that captured the Andes in all of their majestic glory. In Patagonia, we sailed to an island where the only inhabitants were penguins and seagulls. Oops! We only realized later that Little One was swimming in the life jacket. But I never truly relaxed the way I did in Romania. I never felt that feeling of absolute serenity wash over me. I never felt like it was all just an adventure, and nothing mattered. Maybe it’s because I’m a parent now. While hiking up Valparaiso’s intensely steep hills, each of which led to another magical view of multicolored homes and revealed more dramatic murals, I felt my heart burst open. But I was also thinking of Little One. Were his legs covered? Did he need more sunscreen? Was that a minimart in the distance where we could purchase more biscuits for him? And in a small village outside of Puerto Natales, a Patagonian town with mountain air that you only dream of ingesting and views straight from a painting, Ben and I set out to climb the kind of grassy mountain that seemed like it was placed there for people like us to climb. The path up was rocky, and though Ben was carrying a napping Little One in a carrier, I felt my limbs freeze from anxiety. I could not keep going. I could go up, but I would never be able to climb down. The path was steep, the gravel would slip beneath my hiking shoes, and I would slide into Ben with Little One before falling to my demise, while a bunch of Chilean cows looked on silently. Ben tried to encourage me to keep going, but I told him I’d wait with Little One down below. So, we turned around and headed back to the field of wildflowers. And then I realized, Ben was fine, and I was fine, too. I could do this. I could buttsy my way down, or I could walk slowly. “Actually, I can do this,” I said. So, we turned around and recommenced our hike. Ben fearlessly tackling the mountain/hill with Little One. We didn’t get to the top because Little One was squirming, but we did get pretty far. It was the first time I felt anything close to the feeling I’d felt in Romania — freed from my nerves as I looked out onto the gorgeous Patagonian fields and mountains, and felt so lucky to be alive. Traveling to Chile, for me, was about getting back to myself. Getting out of myself. Finding myself somewhere completely new. Our past year and change had been a busy, tumultuous, beautiful, and intense one. 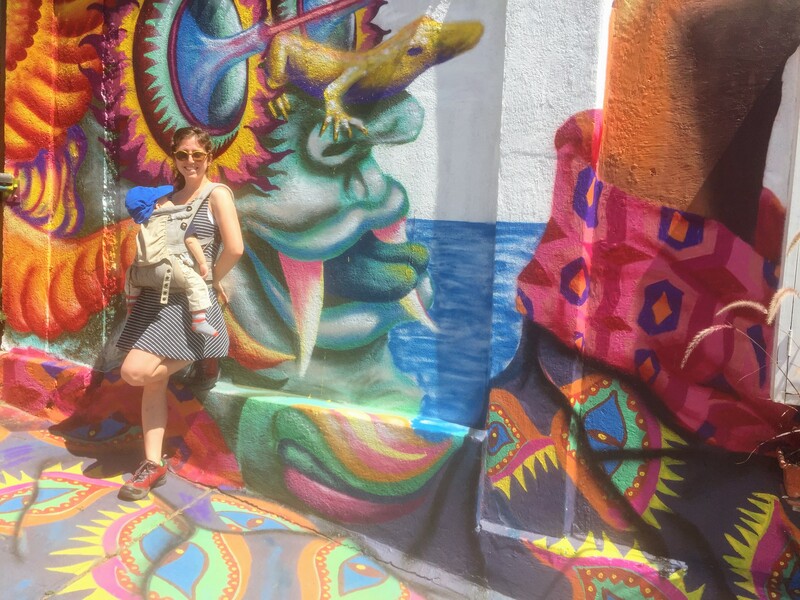 I gave birth via c-section, learned soon after that I needed a different surgery, left our home and wonderful community in Tel Aviv, and moved to New York. Ben had changed his job and I built a new career for myself. I recovered and we forged a new life in a new community with our new baby. It all happened so fast, with Little One growing and changing, that we barely had time to ask ourselves, What was that? What happened? Where are we? Traveling to Chile, for me, was about getting back to myself. Getting out of myself. Finding myself somewhere completely new. Creating new and beautiful memories — images and feelings to come back to when I need them most, or just on any regular day. We managed to have a full and very active trip. But what surprised me was that, unlike on other trips, when I could laugh off all of the mishaps (maybe not in the moment, but at least, an hour later), this time, I couldn’t 100% relax. I was a new me. A mother, concerned first and foremost about the wellbeing of our Little One. And when he was happy, I was happy. It was just that simple.